Holocaust Controversies: This is a serious case of ... well, "Revisionism"
This is a serious case of ... well, "Revisionism"
In his CODOH post of Thu Jul 26, 2007 2:08 pm, my old friend "Haldan", aka "k0nsl" aka Jonathan Andersson, committed the imprudence of mentioning my name. While I usually let the Cesspit lunatics spout their boring nonsense as they please, when they mention me in their babblings I take a closer look at the same, and that’s what I’m going to do now regarding Mr. Andersson’s post. This is supposed to be a mass grave that held 900,000 Jews at Treblinka. It sure is. I tried to ask Nick Terry, Roberto and I believe even Andrew E. Mathis about this strange "mass grave". I said, all I see is wooden planks and some form of sheet material - "where are the bodies, where are the human remains and how could so many corpses fit in such a small grave?" No reasonable response from neither of those self-proclaimed Holocaust Experts. None. b) if the bodies are mostly not visible (there are arguably three at the top of the grave that can be made out), this is because they are covered by wooden planks and what looks like tarpaulin sheets, which may have been related to an effort on the part of the camp staff to stretch the capacity of the mass graves by "top down" burning, or (see the comment on this site) to an experiment on whether the bodies could be effectively burned inside the mass graves. If this answer was not "reasonable" enough for Mr. Andersson, that’s because his criterion of reasonability is a rather peculiar one that he shares with most if not all fellow "Revisionists": whatever fits his preconceived notions is necessarily "reasonable", and what does not fit those notions can never be. I have that discussion saved somewhere and will look it through sometime. Very embarrassing! However, all three of the gentlemen stuck by the insane claim that its a mass grave which held 900,000 Jews. That’s about as thick a straw-man as I have ever seen. Neither Nick, nor Andrew, nor I maintain that the number of victims of Treblinka was necessarily as high as 900,000 (the documentary evidence rather points to an order of magnitude of 750,000 to 800,000, and the very site that Andersson's brother-in-spirit Jonni "Hannover" Hargis started out making a fuss about states that "Jews from the Polish Districts of Warsaw, Radom, Bialystok and Lublin as well as others from Theresienstadt concentration camp, Macedonia and the Reich comprised he nearly 750,000 people who would die in the gas chambers of Treblinka between July 1942 and April 1943"), and neither of us has claimed that the bodies of the victims, insofar as they were not incinerated right after the killing during the later stages of Treblinka’s operation, were buried in one single mass grave. 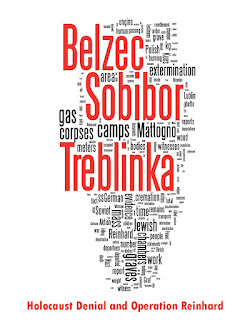 My take on the number, size and capacity of the mass graves at Treblinka is explained in my articles Polish investigations of the Treblinka killing site were a complete failure … and Videos, a must see!, among others. A mass grave of wooden planks and sheets spread here and there is evidence enough for those gentlemen that the Germans did away with 900,000 Jews - yet can not explain why there are no human remains. 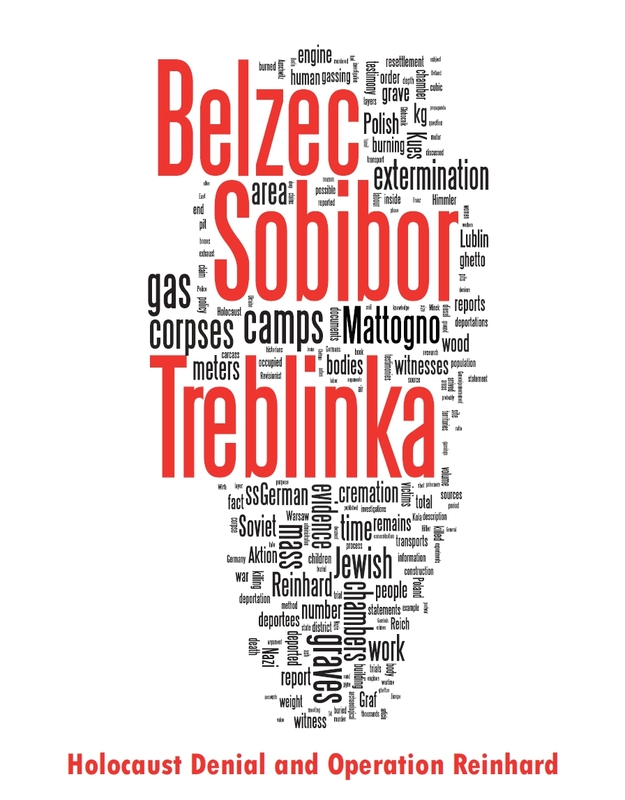 • demographic evidence showing that none but a few dozen escapees from among the hundreds of thousands of deportees were ever seen or heard of again after entering Treblinka. As to the claimed absence of human remains, Andersson should start doing something about his ignorance by reading this article, which is based on sources quoted by "Revisionist" guru Carlo Mattogno. Actually, I find it all a bit hilarious; a tiny picture, some wooden planks and a bit of yarn here and there, and you've got a "mass grave" of Jews. is just plain infantile and yet another indication of the inability of "Revisionists" to understand that context is the name of the game: the picture in question is only known to show a part of a Treblinka mass grave because it is part of an album of photos taken by Treblinka’s second-in-command Kurt Franz, who in turn described the mass killing and body disposal procedure at Treblinka at his trial before a West German court (in which he was sentenced to lifetime imprisonment), and whose description is corroborated by those of other eyewitnesses and further evidence independent of him. Without this context, the photograph in question would be completely meaningless, and even within that context it is just one out of many exhibits, which provides no meaningful information except in connection with other exhibits. In the meantime, there are a endless list of real mass graves where the victims are German, Polish, Latvian and other Europeans, everywhere - easily identified as such! I would love to see the fellow trying to show but a few examples out of the "endless list" he claims. As I pointed out in this article, only a fraction of the mass graves containing victims of Stalin’s purges or penal camps, of crimes committed by Soviet soldiers against German civilians in 1944/45 or of postwar expulsion atrocities against ethnic Germans in Poland, Czechoslovakia and other countries, have so far been found. On the other hand, the former occupied territories of the Soviet Union are full of Nazi-made mass graves investigated by Soviet state commissions, whose findings are largely corroborated by evidence independent of the Soviets, as in the examples mentioned in Nick’s article Mass Graves in the Polesia and in my article Neither the Soviets nor the Poles have found any mass graves with even only a few thousand bodies …. Hundreds of such mass graves have lately been located again in the course of the Yahad in Unum project. But here we are looking at a microscopical picture of a small hole with some wooden planks in it, and that is evidence of murder by the Germans, of 900,000 thousand Jews - almost a million people. No, Mr. Andersson. It’s just a photo showing a small fraction of one of the several mass graves in which, as becomes apparent from a multitude of eyewitness, documentary, physical and demographic evidence, hundreds of thousands of people murdered at Treblinka were buried before they were disinterred and incinerated in order to reduce the amount of incriminating evidence. It is but one of the many pieces that make up the puzzle of evidence to the Treblinka mass killings – nothing more, and nothing less. Yeah, just picture the inane trash that folks like Andersson are capable of uttering in all seriousness. I would consider it impossible that such nuts as Andersson are in existence, were it not for the clear evidence that they actually do exist. You're right. Massacres of the Red Army and by the NKVD never happend - thus no mass graves. It especially never happend in Nemmersdorf and the Latvians never experianced massacres committed by the NKVD either. >You're right. Massacres of the >Red Army and by the NKVD never >happend - thus no mass graves. >It especially never happend in >Nemmersdorf and the Latvians >never experianced massacres >committed by the NKVD either. If any of our readers understood what Mr. Andersson (aka "Franz Holtzhäuser") is trying to say, please let me know.